Letts is writing for one of the best acting companies in America. This Steppenwolf ensemble infuses every moment with full-blooded theatricality. 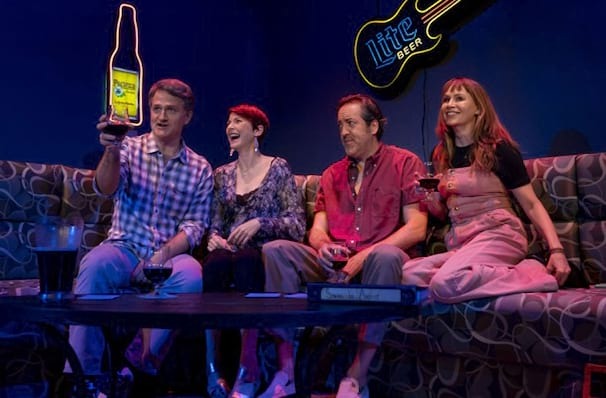 In partnership with the Center Theater Group, Second Stage presents the Steppenwolf Theatre production of Pulitzer and Tony Award-winning playwright Tracey Letts' brutally funny midlife crisis tragicomedy as part of their 2019/20 theater season. Fused with Letts' penchant for creating distinctive, flawed characters, potently witty dialogue and thought provoking psychological dynamics, his creations unravel before the audience's eyes in a whirlwind of episodic scenes that punctuate the trainwreck that is central character Wheeler's life. In the throes of the midlife crises to end all midlife crises, Wheeler is a fifty year old Caucasian male going through a divorce, having thrown in the towel on his marriage, his job and himself. Yet don't feel too sorry for him, because underneath it all he's really a smooth operator whose self-deprecation and hangdog appearance hides his cocky bravado and sense of likeable anti-charm. When he moves to the gated community of Linda Vista, San Diego, he finds himself in a love triangle with two very different women. Seen Linda Vista? Loved it? Hated it? Sound good to you? Share this page on social media and let your friends know about Linda Vista at Helen Hayes Theater. Please note: The term Helen Hayes Theater and/or Linda Vista as well as all associated graphics, logos, and/or other trademarks, tradenames or copyrights are the property of the Helen Hayes Theater and/or Linda Vista and are used herein for factual descriptive purposes only. We are in no way associated with or authorized by the Helen Hayes Theater and/or Linda Vista and neither that entity nor any of its affiliates have licensed or endorsed us to sell tickets, goods and or services in conjunction with their events.